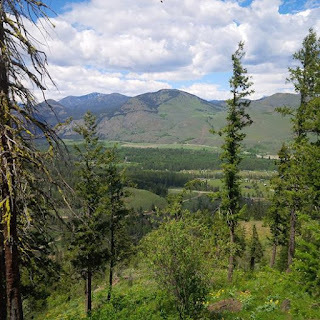 I'm at the Writing by Writers Methow Valley workshop again this year. The drive up was gorgeous. The lodge is expansive and feels like a great place to meet to workshop writing, the beds are heavenly, the location far from city lights & traffic & incidental noise & distraction; good food, friendly staff; the faculty and participants are delightful. And I was sitting here on a free-time break, in my room, on my laptop (my roommate is out hiking; some people are writing; some are in the hot tub or doing other activities). And thinking. Last night I skipped the Cowboy Dinner, which also meant missing the founder's reading. But I skipped last night's event because I was writing. During the day yesterday I knew I was going to stay and write, because I felt inspiration in me, waiting for me to sit down and listen. I didn't know exactly what it was but something was there. And I was right. I wrote a small but very major piece of the story. A piece I've struggled with since stories morphed and became The Writing Project. And I also am 100% sure it is right because the other thing that happened is that this new -- okay, I'll say it -- new ending not only feels right, but there are other signals that it is the right thing to do. Because this new ending of this book means there are some things I have to go back and change, or back and add, through the entire project. And I am completely fine with that. This is what needs to happen and it feels right and I'm looking forward to my next tasks. Which are huge. And I do mean gigantic huge pieces of writing work. Wow. Yesterday, the second full day of workshops and events, my creativity said "hello, oh it's you, yes, I know, but I've been waiting for you and now you're ready, so let's go." Yes, I get small bits here and there. But this is the real deal. I don't know how it will balance out. Still or again and that question doesn't entirely matter right now. This was another moment of noticing how having time held for the sole purpose of writing and writing related conversation/inspiration/sharing/exploration generated - surprise - writing. And sitting here on my bed with my laptop, I was thinking about the last three mornings of workshopping other writers' pieces. Discussing creation and craft and opening and what's working and ideas for going deeper and richer and signature moves. And that, even though I was alone in the room last night when I was writing. Even though I am often alone when I am writing, for me, at least, writing really is not a solitary task. And even the Tuesday times when I meet with another writer for two hours and we write, my writing is mine and hers is hers and we are together but doing the parallel task of writing independently. And I think - not for the first time - that writing is not a solitary task. Not really. Or not always. There are solitary elements and times where we probably need to be alone to do what we're doing. But writing, I don't think, is solitary. It can be at times. But it isn't really. I'm sure someone can give me some names of writers who have done it without anyone else. But these days here I see, again, how we need each other, too. How our writing can be strengthened by having other eyes and ears on our words. How other perspectives can help us see our work in new ways. And, as Lidia says, they can help us find our "signature moves." Which we don't always see because we are too close to the words or other reasons. So the words are individual, yes; the stories come from our bodies. But we benefit from exposure and time with other writing beings, other creatives. The myth of the lonely writer is another traditional trope I think we can let go of, too. Writing in community has many benefits.